Commerce and digital marketing teams tell a familiar story. The commerce team launches an online store on a commerce platform. Commerce and IT focus on the platform and evolve it as the online business grows—focusing on basics such as PCI compliance and product information and expand-ing to more complex integrations. Now they want to add content, such as reviews and engaging media, that will inform and guide shoppers. Meanwhile, the digital marketing team regards the online store as a missed branding and engagement opportunity and tries to jump in and contribute only to find that the system can’t meet their needs. So marketing goes outside to a digital agency, pays for a separate microsite, and takes their creative production needs elsewhere. And thus a classic divide is formed. 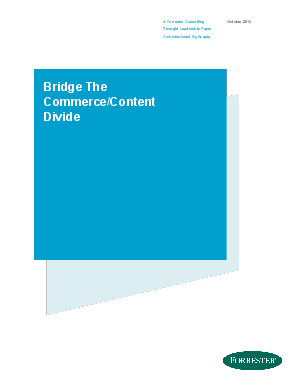 Download the Forrester Report to learn the impact of integrated and personalized commerce experiences.